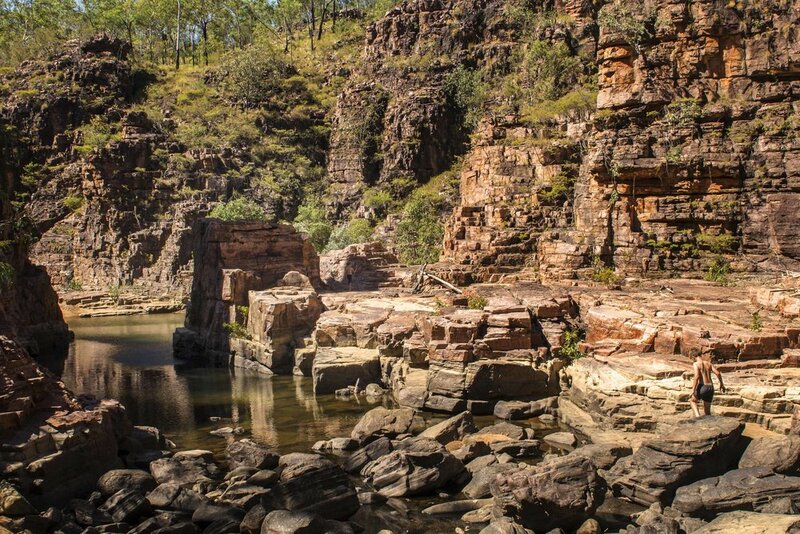 The entrance to the gorge requires a short walk of about 600m from the car park. The main pool is guarded by a climb over a small cliff face, or you will need to wade through a shallow pool. This breaks open onto a large sandy beach and a deep, cool swimming hole. The beach provides a perfect setting for a lunch break. The swim from the beach to the entrance of the first gorge is about 70m, and the entrance is very narrow – less than a metre in width, at least 4m high, and about 10m long. The First Gorge contains, several pools all fed by small cascading waterfalls from the plateau above. 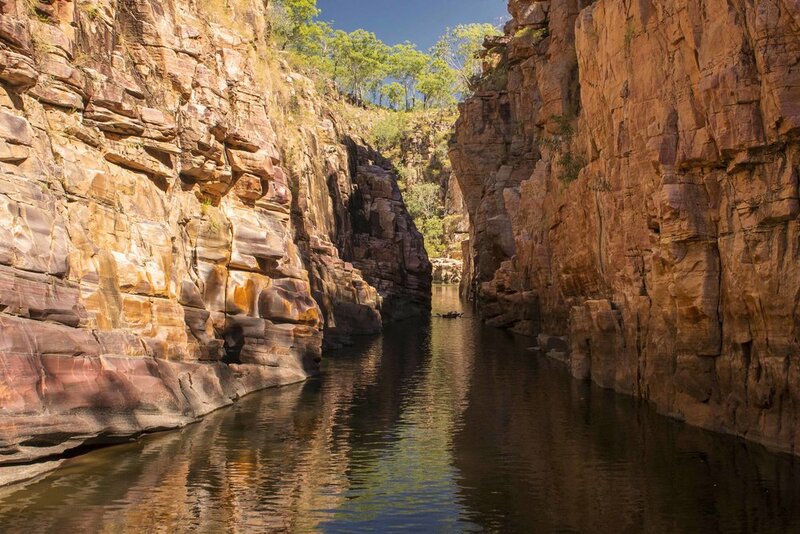 This gorge is about 100m in length and will require you to swim to get to the end. 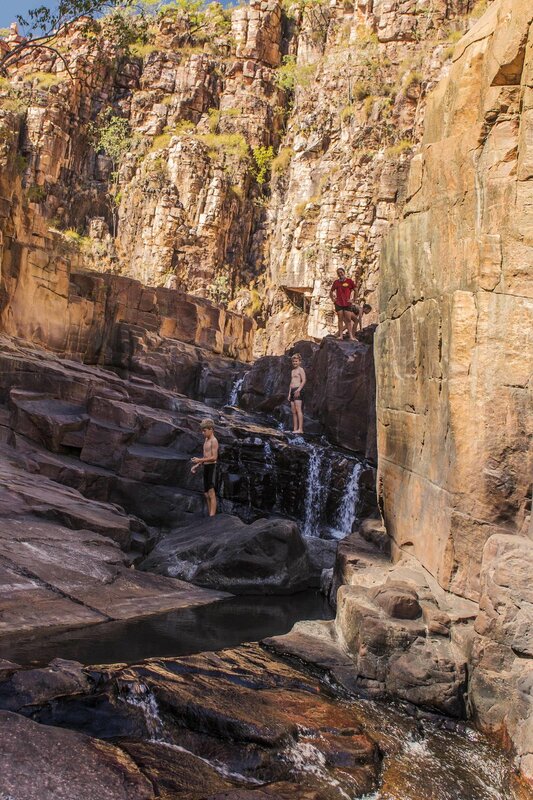 The last pool in the gorge is the largest with high rock walls on each side. 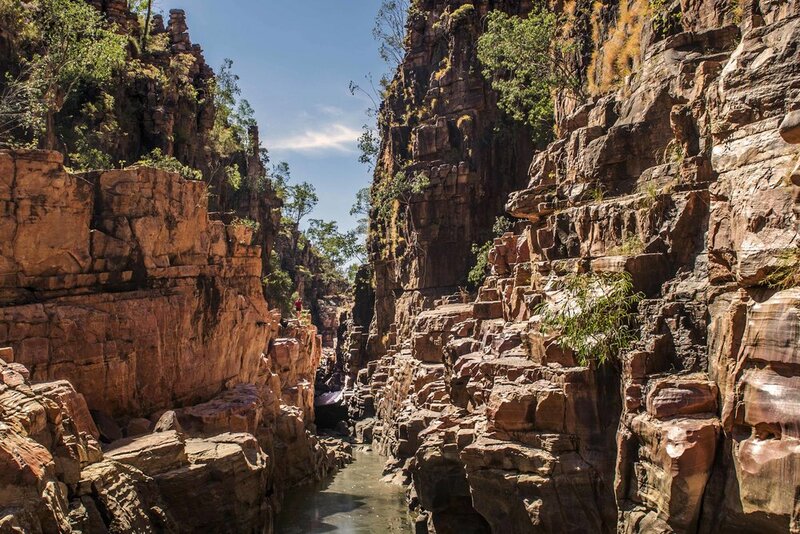 Leaving the first gorge, the walls of the gorge widen and the surrounding land flattens, allowing you to take in some of the spinifex-covered plateau. You then transverse a black boulder-strewn riverbed. The boulders in the riverbed (as well as the gorges) have polished rock surfaces and can be very slippery. This section of open riverbed is about 350m long. A large, deep pool guards the entrance to the Second Gorge with a sandy beach on the left (looking upriver), which is the domain of a freshwater monitor (Mertens's Water Monitor). The gorge then angles to the left, (looking upriver) and then narrows into a long gorge with deep water necessitating a swim of about 100m. This second gorge remains narrow, with steep cliffs on either side, and rock walls polished by the river swollen to a torrent by the wet season rain. This section can prove to be the most challenging with the sheer cliff walls allowing no room for a track. The riverbed is still under water, but with sections now becoming stagnant, filled with rather foul smelling water. This section continues on for about 300m before opening up into the Third Gorge. We did not venture into the Third Gorge. This will be an adventure for another day with what looks like another 2km of gorge to explore. Trails above the gorge also need exploring. The gorge is about 3km long of which we have only explored the first kilometre. The turn-off to Butterfly Gorge coincides with the turn-off for Douglas Hot Spring. After turning off Dorat road, travel 26km south on Oolloo road. Then turn left and travel on a graded dirt road for 24km to the car park at Butterfly Gorge (passing the turn-off to Douglas Hot Springs after 7km). The last 17km is considered a four-wheel drive track and crosses the Douglas River three times. The road is graded and was in good condition when we were last on it in 2017. The gorge only opens [often late] in the dry season. No camping is permitted at Butterfly Gorge. 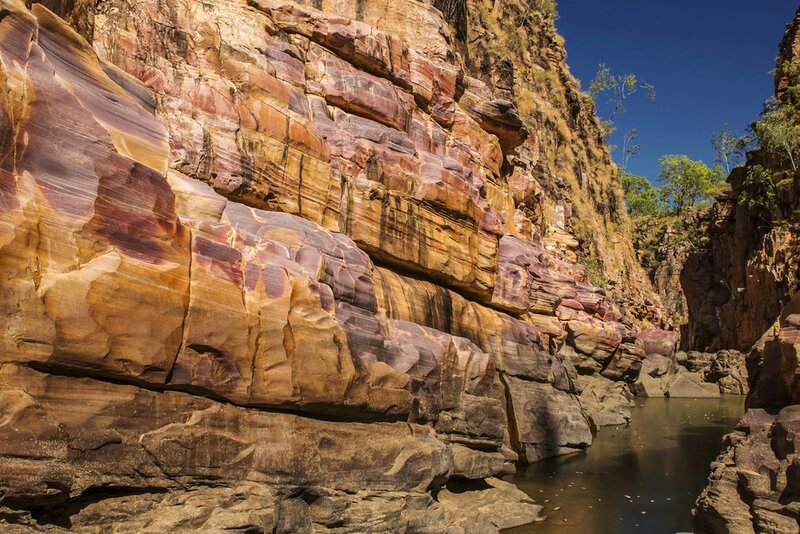 For further details check out the NT Parks Board fact sheet.